So…. 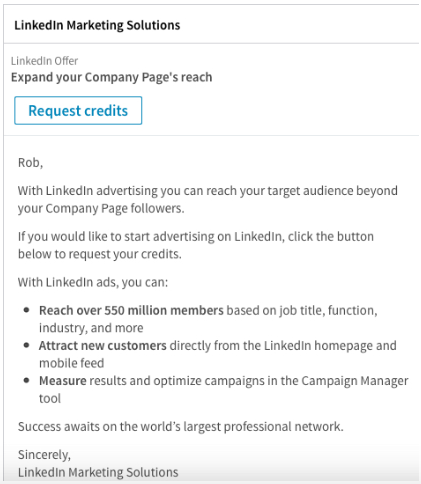 you want to start advertising on LinkedIn? You’ve probably been thinking about it for a while, years even, right? Or maybe, you’re already using pay-per-click techniques on Facebook, Twitter, or Google. And now you’re ready to do the same with LinkedIn. Either way, we’ve got ya covered. Attract more leads and prospects on the world’s largest business stage. This makes good business dollars-and-sense. After reading this post, you’ll be a LinkedIn monster. You’ll gain expertise to use LinkedIn ads to get more appointments, with more leads for your biz. From setting up your ads to tweaking and improving them over time. Okay, not everyone. Just 560 million of them. Them being, business professionals—a serious bunch who know what they want. Forty percent of them have conversations everyday on LinkedIn. Conversations you want to be in on, right? All this making LinkedIn a place where business people hang out. Don’t believe me? Fine. See for yourself. All of them are eager and able to hear your message. And act on it. That is, if you’re in the game. If not, you’re handing business over to the other guys. Hey, want to be high-stakes player on LinkedIn? Of course you do. Check out these demographics and statistics. Try it and see. Create an ad to see the audience you’ll reach and attract. Then decide. As for costs, you’ve got options. Spend a daily amount, as little as $2 per day, for say, a short-term, one- or two-month campaign. Or, pay based on performance with pay-per-click or pay-per-impression ads. 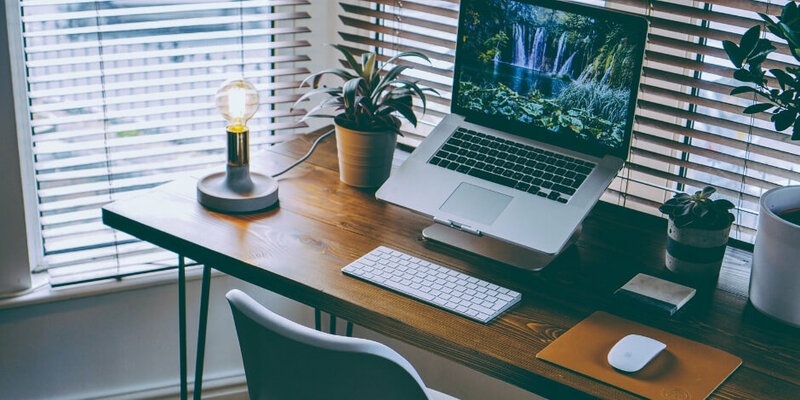 These are a few of the benefits of adding LinkedIn advertising to your marketing strategy. Let’s learn about the types of ads in the LinkedIn toolbox. Want to target your message to executives? Influencers? Job seekers? Getting clear on the who will help you determine the what. Each type of LinkedIn ad has its own benefits and approaches. They come in two flavors: Self-Service ads and LinkedIn Advertising Partner Solutions. Like the name implies, you can start today, all on your own. Dig in with Campaign Manager, a snappy tool to do it all. 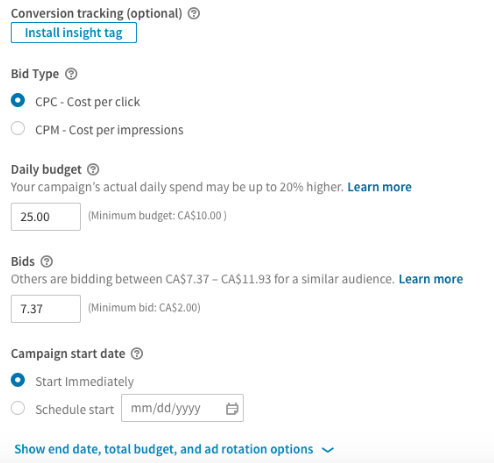 Schedule campaigns, target your audience, and see who’s clicking on your ads. This takes time and effort, like any work worth doing. But, it’s easy to follow and a great way to dip your marketing toes into LinkedIn advertising. A way to promote existing content already on your Company Page. Share your posts with a targeted audience. Broadcast company news, upcoming promotions, useful articles, SlideShare presentations, and Vimeo & YouTube videos. These ads appear on the home page feed- for desktop, mobile and tablet. Got a one-day-sale coming up? Or a video of a recent charity event? Perfect, spread that cheer to a wider net, showing how your company is helping others. A way to drive traffic to your LinkedIn Company Page or website. Create variations of campaigns to see what works best. For instance, clone an ad, then change the headline. Compare the results for each of these ads. Isolated tweaks will help you improve your ads over time. These ads run only on desktop, showing up on the right rail of the news feed. They’re a great way to grab the attention of a busy professional browsing LinkedIn. A way to deliver personalized messages to users’ LinkedIn inboxes. People develop trust when they feel you’re talking directly to them. They’ll be more likely to hit the buy, click, or call link, too. Sponsored InMail will get to users, no matter what devices they’re using. Messages have a custom greeting, call-to-action button, body text. You can also add a link in the message body. Messages will appear in their inbox just like they do for regular messages. Pay for only the messages you send. 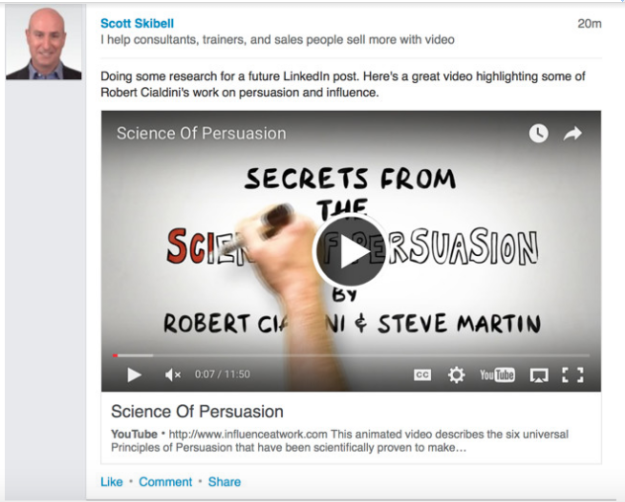 A way to use sight, sound, and motion to tell more interesting stories for your LinkedIn feed. The more senses you include, the more ways people will relate to your message. Hmmm, what next for smell, touch and taste? For marketers, video has skyrocketed for consumer brands. B2B is quickly catching up. With LinkedIn as the numero uno business-to-business platform, time to get on this v-train. Show how cool you really are. Maybe a new career awaits you. No specs or guidelines from LinkedIn yet. It’s a brave new world. A way to target an exact audience in a uncluttered environment. Display Ads is LinkedIn’s programmatic advertising solution. You can buy ads through your favorite advertising platform, or a private or public auction. They’re great for using a variety of media, including text, audio, video, and images. Also, this is an excellent option to be seen in a highly-specified audience, early in your buying cycle. Here’s the specs and guidelines to learn more. A way to show personalized ads, dynamically generated based your audience’s activity. Say LinkedIn knows someone is searching for a job in your industry. Target them at the right time with the right messages. They’re great for building relationships and delivering personalized messages to the most influential people. Too, drive more traffic to a landing or your Company page. Members can send you their name and email address from the dynamic ad, without typing a thing. Then, your content will download to their desktop. 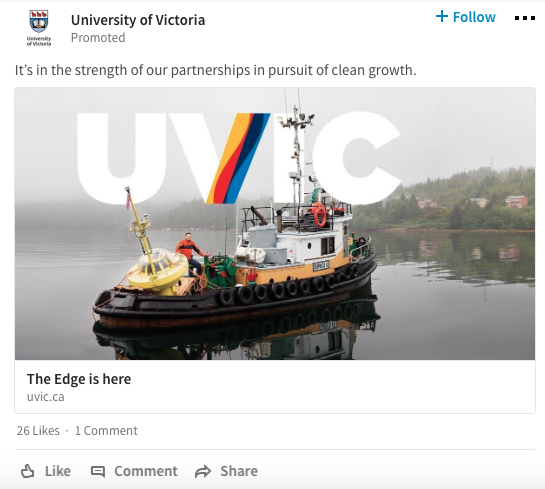 LinkedIn serves only two visual ads on a page at a time. Quite the noise-and-clutter-free solution. See the specs and guidelines to learn more. Okay, we’ve learned about the types of ads to do yourself, using Campaign Manager. Cool, right? But maybe you need help from an expert? Or, you want to outsource your LinkedIn advertising. Find and work with a LinkedIn partner. Each partner offers different tools, like ad technology, content creation, and media buying. This will help you run campaigns with an even greater ROI. By the way… Hootsuite is a LinkedIn marketing partner. We’re experts. Experts in social media, experts on LinkedIn. We combine the two to help you deeply engage with your audience- oh yeah. Contact us today to learn more. Why work with a LinkedIn ad partner? Want even more insights and answers? See a bunch here. We’ve covered a lot to this point. Time now to roll up your marketing sleeves and get to it. Okay, now… ready, set, go. Getting started is easy. We’ll show you how in six steps. We’ve abbreviated this to get you going. If needed, see more details here on LinkedIn’s helper page. Which you can do here. Just takes a few minutes. Really. Create multiple accounts, too. Go crazy. Select the type of ad you want to create. Create an entire campaign using all three formats for maximum impact and reach. Specify options for targeting your ad to the right people. Such as, location, company names, school names, job functions, skills, and other filters. Save your choices as a template to speed things up later, when creating other campaigns. Step 5: Set your budget. And schedule, too. For CPC and CPM, set a daily spend limit and a bid price. This states the max you’ll pay per click or impression. Choose a start and finish date for your campaign, too. Want to know who’s interacting with your Sponsored Content and Text Ads? And how? Add conversion tracking. Track specific actions to measure and improve your ROI. Such as: sign-ups, installs, downloads, and purchases. If you’re going to pay for stuff, nice to know how it’s performing. LinkedIn makes this easy. 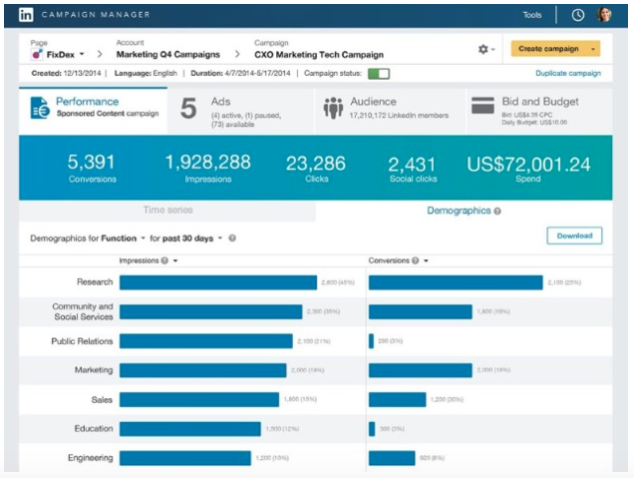 Campaign Manager helps you measure and optimize your campaigns. Metrics include impressions, clicks, and spend. And, measure “social actions,” seeing how members interact with your content. That’s it. You’re now ready to create, run, and optimize ads on LinkedIn. Again, learn more details here, if needed. Creating and running LinkedIn ads is one thing. Making them work well for you is another. Write from the reader’s perspective, not yours. Because it’s about them, not you. Write from the reader’s perspective. Because… people don’t care about what you do. They only care about what they can get from what you do. Use relevant images. On a budget? See 20 free sites for great photos. Write personalized content by segmenting your audience. For example, by job title, function, industry, company size, and seniority. Tailor your message accordingly. Test frequently using variations of your ads. See what works best. Do more of those. Budget and bid wisely. Consider maxing out your CPC for direct response strategy. For CPM, you’ll pay your max bid for per 1,000 impressions. More tips here. Measure to improve your ROI. 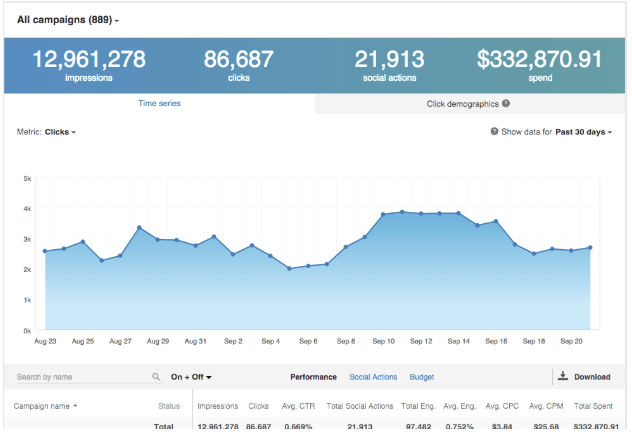 Campaign Manager tracks performance by monitoring impressions, clicks, costs, and more. Use these metrics to maximize your ROI. That’s our guide to LinkedIn ads. There’s a load of pros needing what you offer. Millions of them. Now go update your profile pic. Maybe put some gel in your hair, too. I’m just sayin’. 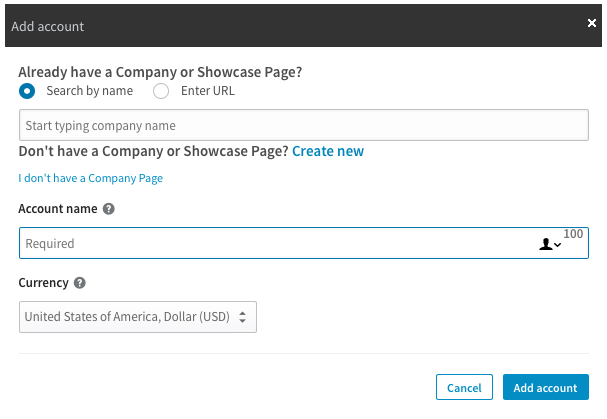 Easily manage your LinkedIn Company Page alongside your other social channels using Hootsuite. From a single platform you can schedule and share content—including video—and engage your network. Try it today.